I swear I've done something interesting in the last month. So why the lack of updates? I bought a new TV, maybe that has something to do with it. Also the ramen thing I do has had some developments. Also getting ready for our annual motorcycle charity event. You can see some pictures from last year's here. The gist is that we get toys and what not, strap them to our bikes, and ride from Tokyo Tower to an orphanage somewhere to give the kids the gifts. 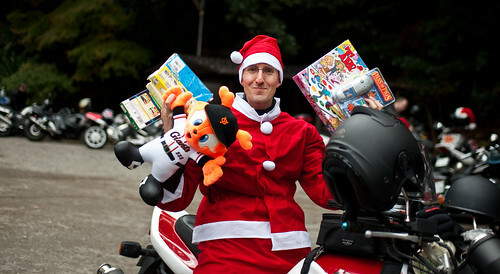 Last year we had something like 80 bikes, with at least half the dudes (and chicks) dressed like good old Saint Nick. Actually, this sort of event is really popular worldwide. I've heard tales of thousands of bikes showing up. But Japan never had anything like this, so my motorcycle club, Gaijin Riders, set it up. If you'd like to help out, you can send me some money on paypal and I'll use it to buy some cool stuff. I'll throw you some mad props in a follow up post as well. The run is in 2 weeks, on December 12th.